On June 14, Rep. Steve Scalise (R-LA) was among five people shot during a Republican baseball practice in Alexandria, Virginia. 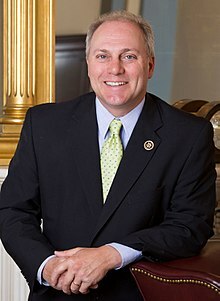 Scalise, the U.S. House majority whip, was shot in the hip. Other victims included a member of Scalise’s security detail, U.S. Capitol Police officer Crystal Griner; Zack Barth, an aide to Rep. Roger Williams, R-TX; and lobbyist Matt Mika. The suspected gunman, James Hodgkinson, was shot dead by Capitol police. And now, some GOP lawmakers think they have the answer to foiling any future such attacks: They want to carry guns themselves. Rep. Chris Collins (R-New York) told CNN: “I’ve had a carry permit for 30 years, and I would say off and on in different instances where I have, you know, felt it was appropriate, I would carry the weapon on myself. That, of course, is the standard mantra of the National Rifle Association (NRA). But even highly-trained shooters–such as those assigned to the United States Secret Service–don’t always respond as expected. None of Wallace’s bodyguards got off a shot at Bremer–before or after he pulled the trigger. Suddenly, soldiers bolted from the rear of the vehicle, throwing hand grenades and firing assault rifles. They rushed straight at Sadat–who died instantly under a hail of bullets. Meanwhile, Sadat’s bodyguards–who had been trained by the CIA–panicked and fled.